We are loving every single minute of JoJo’s season on The Bachelorette, just as we loved every minute of Ben’s Bachelor season before this. While JoJo on TV every Monday night is a great way to get our #BachelorNation fix, we are preeeetttttyyyy excited by the news of a Lauren + Ben reality show coming to Freeform. The show will apparently be called Ben and Lauren: Happily Ever After, and will follow their lives as they get ready for the big day. We heard a little while ago that Ben was dipping his toe into politics, and now it seems this reality series will track that journey, as well as Lauren’s quest to find her post-Bachelor identity According to the press release, former Bachelor and Bachelorette stars will also stop by frequently to dole out their love advice. The show is the fourth Bachelor spinoff, and the first time a couple is getting their very own series (there have been wedding specials before, but nothing like this!). 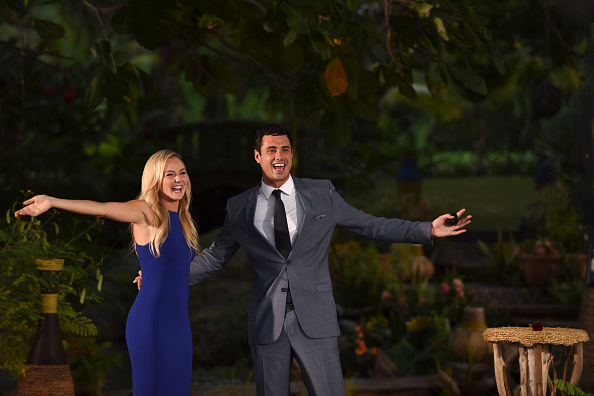 We are delighted as well, and we’re sure Ben and Lauren are too. We will definitely be watching when Ben and Lauren hits Freeform in October.